When choosing your chandelier, scale matters a lot. There are a lot of factors to think about, but here is an easy way to calculate the best size for your dining room. That’s your smallest chandelier width. 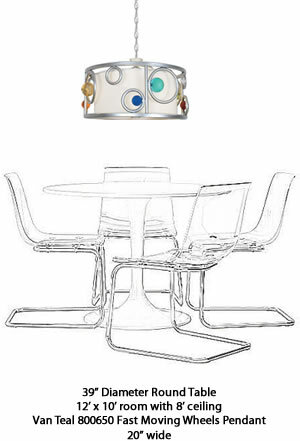 So, a 48″ table gets a 24″ or more chandelier. 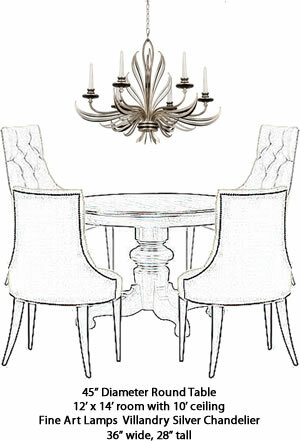 If your table is heavier or darker, either choose a heavier, darker or larger chandelier. 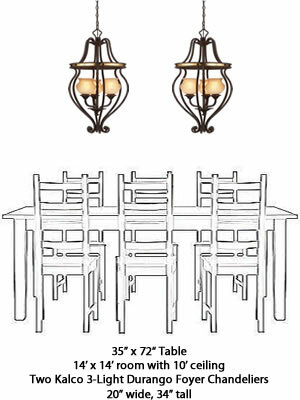 If your table is lighter in scale, plexiglass or glass or low contrast (the same color as the rest of the room); choose a chandelier that matches the scale and feel of the table or go with a smaller chandelier or pendant. If your table is rectangular, what is your perspective as you walk into the room? If you are looking at your table from the narrow end, that is your measurement. If you are looking at your table from the wide side, that is your measurement. You might want to us an oval chandelier or two chandeliers or pendants. This beautiful eclectic crystal chandelier is available in a variety of sizes, including ovals. It can be hand twisted to fit your home. Add the length and width together. The total in feet is your chandelier width in inches. So a 14′ x 18′ room gets a 32″ or so chandelier. 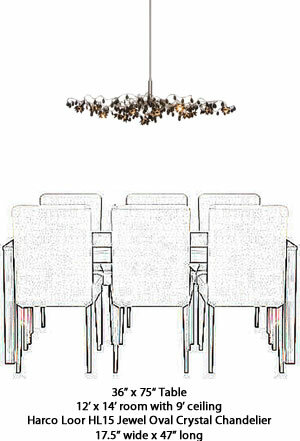 Since your dining table usually fits the dimensions of your room, you should get a similar number using both methods. If your chandelier is not in the center of the room, or if it is in an area of a larger open floor plan, you might want to measure from the outlet box to the closest wall, then double that to get your measurements. So if your chandelier will hang 5 feet from the closest wall on one side and 6 feet from the closest wall on the other side, (5+6) x 2 = 22. A 22″ chandelier should fit the scale of the area. The table will likely be smaller, too. This entry was posted on November 15, 2012, in Chandeliers, Lighting, Planning and tagged best size chandelier, Choosing a chandelier, decorating, decorative, decorative lighting, dining table chandelier, feel, glass table, How big should my chandelier be?, interior design, lighting, lighting plan, oval chandelier, planning, planning a room, plexiglass table, rectangular table, scale. Bookmark the permalink.